The Empire Hotel in Subang, Selangor, may be a new player in the market, but plans are already afoot to grow the brand and its business. The RM60 million hotel is part of the RM250 million Empire Gallery project, which is developed and managed by Mammoth Empire Holdings Bhd. 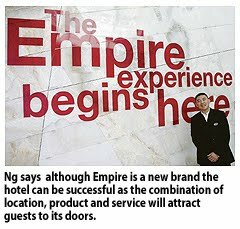 The Empire Hotel is a 198-room boutique business class hotel that is scheduled to open at the end of this month. Its general manager, Ng Yee Ming, said the company is looking to open a second boutique hotel in Kuala Lumpur and possibly a third in the suburbs of Selangor. The group may run as many as three hotels in the next three years. Although a new hotel brand, Ng feels that it can be successful as the combination of location, product and service will surely lure guests to its doors. "The hotels will be located in prime areas, and we expect that we will do well with competent people on board," Ng told Business Times in an interview. "Our focus will be on guest experience," he said, adding that it has hired staff from five-star hotel chain. The hotel, which has four restaurants, has a lean staff to room ratio of 0.65. For the maiden Empire Hotel, Ng expects that the hotel will be able to rake in an average room rate (ARR) of between RM230 and RM250 per night and fill 65 per cent of its rooms in the first year of operation. Should the hotel achieve its projection, it would be a commendable feat, as most hotels in their first year of operations garner about 50 per cent occupancy. Ng said the optimism stems from the fact that its product is new and the Empire Gallery also houses a mall and offices. In the first year, the Empire Hotel also aims to achieve gross operating profit (GOP) of 32 per cent. GOP is the gross revenue from rooms, food and beverage, laundry or business centre minus cost of operations like wages, electricity and amenities. In the second year, the hotel is looking to improve occupancy to 70 per cent and post an ARR of RM250 per night. The hotel, described as having an artistic feel, plays with a lot of colours. The owners brought in 10 carpenters from China to help with the numerous details in the decoration. The person behind Mammoth Empire is Datuk Sean Ng and the group's projects include The Ara, The Loft and The Atrium in Bangsar, Kuala Lumpur. It has also done projects in Senawang, Negri Sembilan, and Bandar Baru Bangi, Selangor. 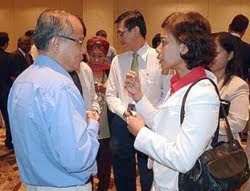 Arlida Ariff meeting participants at the Iskandar Malaysia Forum 2010. SINGAPORE: Iskandar Investment Bhd (IIB) will hold more roadshows in Singapore within the next six months to attract more investors to Iskandar Malaysia. President and chief executive officer Arlida Ariff said IIB wanted to attract more Singaporeans – who were already making inroads in Iskandar in the education and the health sectors – to the tourism, leisure, services and property sectors. “There seems to be renewed interest from investors in the republic in Iskandar following the economic recovery both in Singapore and Malaysia,” she told journalists yesterday after presenting a keynote address in the Iskandar Malaysia Forum 2010 jointly organised by IIB and the Institute of South-East Asian Studies. Arlida said Singapore was one of Iskandar’s top investors with its private companies holding more than RM2.64bil worth of investments in the manufacturing sector. In fact, long before Iskandar was launched on Nov 4, 2006, Singaporeans already formed a large group of foreign property buyers in Johor and had regarded the state as their second home, she said. Now, more Singaporean property buyers were attracted to Johor’s real estates, especially with the upcoming business and lifestyle developments that were due to be completed in Iskandar, she said, adding that Singapore investors would normally give their first preference to invest in Malaysia, particularly in Johor, before looking at other areas in the region. Arlida said the forum was a good platform for potential investors from Singapore to get a first-hand information from IIB on the opportunities in Iskandar and the development taking place in Malaysia’s first economic growth corridor. She said many participants at the forum wanted to know whether Prime Minister Datuk Seri Najib Razak was committed to continuing the development in Iskandar as the corridor was the brainchild of his predecessor, Tun Abdullah Ahmad Badawi. She said stakeholders of Iskandar – the Federal and Johor Governments and the Iskandar Regional Development Authority – and IIB had assured investors that the policies remained unchanged despite the change in leadership. LOH & Loh Corp Bhd, owned by construction outfit UBG Bhd, hopes to do better in the current financial year ending December 31 2010 in view of new projects in hand. The major jobs it has secured over the past 18 months are RM142 million worth of infrastructure works in Medini in Johor's Iskandar Malaysia and a RM273 million job in the Seremban-Gemas double-tracking railway project. "We are a healthy company. We should continue to do well this year. Our property development is building up and we expect higher contribution from the division," its chief executive officer Jason Loh said. Its new projects are Idaman Hills in Selayang, comprising 38 semi-detached homes and 142 bungalows, and The Peak, a high-end residential project in Bandar Sri Damansara, worth more than RM300 million. Last year the company posted a net profit of RM27.5 million, 16 per cent more than in 2008. Loh & Loh was set up in 1965 as a civil construction company by the late P. K. Loh. The company's first contract was for earthworks for a housing project in Bangsar, Kuala Lumpur, for RM6 million. The company grew quickly and over the past 45 years has built 15 dams, 48 water treatment plants and over 50 water intakes and pumping stations. It has also constructed and installed over 250km of large diameter pipelines, and built sewerage plants, river gates, reservoirs, buildings, roads, bridges and golf courses.